Speaking with David Piling in a Financial Times interview, Lunch with FT, the multi-billionaire, who is Africa�s richest man, revealed a soft side of himself and talked tall about his ambitions to buy Arsenal Football club after successfully leading Nigeria�s oil refining revolution. But he agrees that he needs to �calm down a bit�. Who will believe that the man who has one of the biggest food chains in the country, actually fasts at least once a week? Dangote told Pilling that he tries to fast at least once a week, adding that �it helps to clean your system�. As expected, Dangote has a very busy schedule, but who would have guessed that he may also be one of Africa�s busiest, taking over 100 calls per day. About his mails, he says: �you try to be polite and reply but they come back to you with a longer email, not minding that here is a very, very busy person�. �Look Aliko, the world is not going to fall apart if you don�t answer your phone,� Dangote says of his golden advise from Blair. The serial-entrepreneur says once his $12 billion refinery is done, Nigeria will for the first time in her history, become Africa�s biggest exporter of petroleum products. �When we finish this project, for the first time in history Nigeria will be the largest exporter of petroleum products in Africa,� he said. The man with the most amount of the money in Nigeria � officially � says only toughest of the tough survives in Africa�s largest economy. 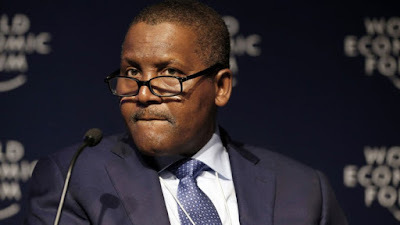 Dangote say with his new refinery, he is out to make new enemies, stating that �you can�t just come and remove food from their table and think they�re just going to watch you doing it�. �They will try all sorts of tricks. This is a very, very tough society. Only the toughest of the tough survive here�. The Kano-born billionaire is not happy with Nigeria�s inability to produce what she eats, locally, and wants some hard policies to stop importation of some products. �What Nigeria needs is to produce locally what we can produce locally. Nigeria still imports vegetable oil, which makes no sense. Nigeria still imports 4.9m tonnes of wheat, which does not make sense,� the $14-billion-man� said. �I love Arsenal and I will definitely go for it,� he told FT, adding that the club should be worth about $2bn. Speaking as the owner of the club, Dangote said he would involve himself in rebuilding the team � �chipping in my own advice�. �When I buy it, I have to bring it up to the expectations of our supporters,� he said, stating that his refinery is priority now. �Once I have finished with that headache, I will take on football,� he concludes.